Are you looking for safe, natural flea remedies that aren’t riddled with chemicals and scary ingredients? It can be very confusing and frustrating to wade through all the flea treatment products available. Many people look to their veterinarians for help. Unfortunately, many vets prescribe topical monthly treatments that can be dangerous for some dogs. According to Peta, the long term effects of using flea prevention chemicals are a great concern to the health of our dogs. Many of our Coton visitors use products such as Frontline, Trifexis, Advantage, or Advantix that can be purchased at a veterinarian office and some pet stores. While many dogs use these products without consequences, many others have mild to severe reactions, even death. The type of flea prevention or flea elimination product you use is a personal choice. This article is for those of you who have made the choice to switch to natural, chemical-free solutions. Let's share natural flea remedies so we can provide safe flea prevention to our dogs who are relying on us for their care. The recommendations reflect your responses throughout this site as well as to the survey below, and will be updated as more people respond. Problem: Some locations are more prone to fleas than others. If you live in an area heavily populated by fleas, more aggressive treatment may be necessary. You are searching for chemical-free ways to treating your lawn outside and your carpets and furniture inside to help prevent fleas. 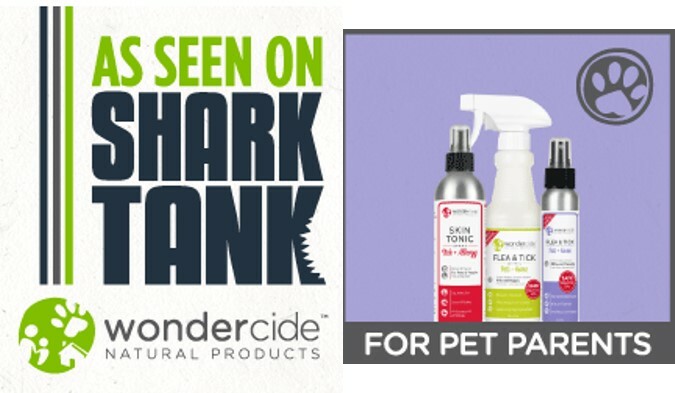 Wondercide - Did you see these products on Shark Tank? This company offers prevention and treatment options that are free of chemicals and pesticides. Many of the products can also be found at Amazon and they're even sold at many veterinary offices and pet stores. My homeopathic veterinarian recommended this to me. They have products for treating your home, lawn, and your dog too. Victor the Ultimate Flea Trap - Plug in this flea trap and it will attract and then trap fleas. This helps eliminate fleas inside your home and is safe and chemical-free. Food GRADE Diatomaceous Earth (DE) - Food GRADE diatomaceous Earth (not pool grade) kills fleas in carpet, bedding, and lawns and is non-toxic. Some find that it can be difficult to clean from your carpets and can cause respiratory problems if not careful during application. This solution is best for severe flea infestations. Fleabusters - Yearly application to your carpet and baseboards will safely protect your dog from fleas. According to users, it can be difficult and tedious to apply, but it's worth it since it safely works for a year. This one is also recommended by PETA. Problem: The most common flea treatments are used directly on your dog either topically or orally. You want to use safe, natural flea remedies that really work. Depending on where you live and the severity of your flea problem, you may have to use more than one of these flea treatments for 100% success. No. 1 - Flea Comb. Using a flea comb is the most common (as well as the easiest and cheapest) flea remedy our visitors use. This comb removes fleas and flea eggs and works great on the Coton coat. Use daily during flea season and rinse with warm soapy water frequently. Flea'n TickB Gone spray. It eliminates ticks and lice as well as fleas by using natural plant sources. There are no toxic chemicals so you can use directly on your dog and his bedding. Flea Flicker spray - repels and kills fleas, ticks, and even mosquitoes. One visitor said "it really works and it smells good". The spray contains botanicals instead of toxic chemicals. Vetri-Science Repel Wipes. These wipes use natural oils such as lemongrass and castor oil to repel fleas. It's a convenient option for when you're traveling or on the go. Only Natural Pet Herbal Defense - This is a squeeze-on topical that's made with non-toxic ingredients that repels fleas, ticks, and mosquitoes. This product is for preventing fleas; not for eliminating them. Billy No Mates. For those of you in the UK, this natural product gets sprinkled on your dog's food and takes approximately 6 weeks to repel fleas, ticks, and mites. No. 3 - Flea Shampoos. Shampoos that have ingredients that repel fleas are especially helpful when used in conjunction with other flea prevention treatments. Our visitors recommend Wondercide Natural Organic Shampoo Repel Bars and Isle of Dogs Flea & Tick Shampoo. No. 4 - Homemade Flea Prevention. Some suggestions from our visitors include rice vinegar and water, apple cider vinegar and water, and lavender. Be very cautious when using essential oils on your dog, as they can be harmful when given the wrong dosage. According to the book, Essential Oils for Dogs Quickstart Guide, cedar wood, mint, sweet orange, and eucalyptus repels fleas and can be used directly on your dog as well as his bedding. This book is very helpful in determining the correct dosage. No. 5 - Flea Tags. Shoo! Tags get attached to your dog's collar and repel fleas for up to 4 months using an electromagnetic strip that's chemical-free. No. 6- Bug Off Garlic is a chemical-free natural insect repellent used to prevent fleas, ticks, and mosquitoes. You can get garlic granules which gets mixed in with food or you can get the garlic in a chewable tablet. In addition to the products our visitors have recommended above, you can find a comprehensive list of products at Greenpaws to determine the toxicity of common flea remedies. 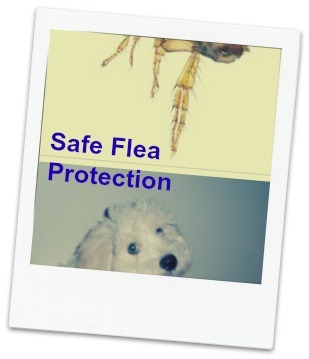 Look up your flea protection method to see how safe the ingredients are. Have you found a natural flea remedy that works? Tell us about it below and help others keep their dogs safe.